Newly minted lawyer Corrie Locke has taken a vow of abstinence. From PI work, that is. Until her best friend Michael finds his bully of a boss stabbed in the back after confronting him earlier that day. Michael panics, accidentally tampering with the crime scene...which could lead the cops to Michael instead of the real culprit. He turns to Corrie to track down the killer. She doesn't need much coaxing. Her late great PI dad taught her the ropes...and left her his cache of illegal weaponry. They return to the scene of the crime, but the body's missing. Racing against time, Corrie dredges a prestigious Los Angeles college in pursuit of clues. All she finds are false leads. Armed with attitude and romantic feelings toward Michael, Corrie dives into a school of suspects to find the slippery fugitive. Will she clear Michael's name before he's arrested for murder? Fast paced, madcap and wacky are some of the first words I would use to describe this series by Lida Sideris. You don't have to read the first book in the series to know what is going on, but once you get to the end you know you want to be up to speed. Corrie Locke has a law degree but wanted a career that was safe and secure. Her father was a P.I. and while she enjoying following him around, being on the fringe of his investigations... OK, to be honest she likes the weaponry and sneaking around. She has two close friends, both very male and handsome. At times she thinks she may want more than friendship, but she'd hate to lose what she has. And it seems whenever she gets involved with something with one, the other also gets involved! When Michael, one of those close friends, finds himself in a "situation" Corrie doesn't hesitate to jump in an help. Or break in and help. Except that Michael claims he saw a dead body and left incriminating evidence at the scene without calling the police. Trouble is, when they return to the scene of the crime, all has been cleaned up and there is no body! Oh, if it was only as simple as all that. Walk away, crisis averted. This is a dialogue driven humorous mystery. When you think things can't get stranger, turn a page. If you've ever worked in a corporate or educational environment, I bet you can even relate to the office politics! If you love to laugh and enjoy a quirky mystery, you will enjoy this book. Lida Sideris is an author, lawyer and all around book enthusiast. She was one of two national recipients of the Helen McCloy Mystery Writers of America scholarship for her first novel, MURDER AND OTHER UNNATURAL DISASTERS . 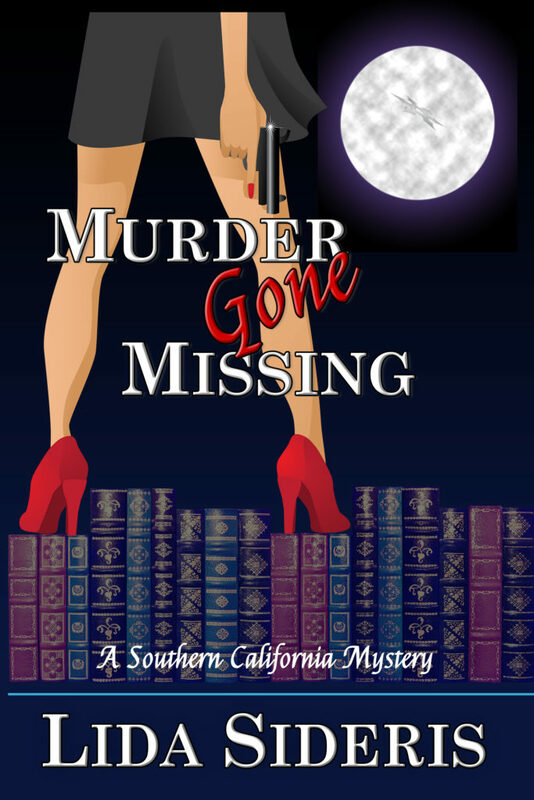 MURDER GONE MISSING is the second book in the Corrie Locke series. Like her heroine, Lida worked as an entertainment attorney in a movie studio. Unlike her heroine, she keeps her distance from homicides. Thank you very much for taking the time to read and to write such a lovely review. SO much appreciated!! !